Open the coChange application and find your location. 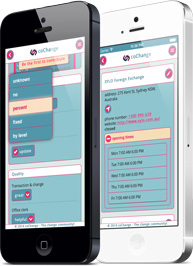 You will see all the currency exchange offices around you. Select your money changer and get its main details. You can then choose between « Rates and details » to get some precise information, or select « Direction » to get the shorest way to go there. Selecting « Rates and details » gives you access to a complete page with community functions. You will find here the address of the exchange office, its phone number, the opening hours, etc. and the informations given by the other coChangers. If you decide to do go there and eventually do your money exchange there, participate and submit details about your transaction. Provide informations about the fees, the quality of the deal, etc. You will be rewarded by points for each feedback. Finally, take a snapshot of the rate board and share it with the coChanger’s community. It will enable the other users to get the latest rates offered by the money changer. Thanks to coChange’s included converter, get an estimate of the currencies that you will get prior to go to an exchange office. Don’t hesitate to bookmark you favorite rates to quicky retrieve them and follow them up. 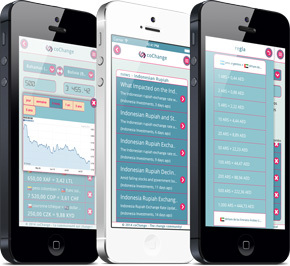 Quickly get some convenient informations about your currencies: graphs, conversions ruler and the latest financial information. Become a professional of the exchange rates to avoid getting outsmarted with exorbitant fees!